In January 1940, Leslie Hore Belisha, Britain's Secretary of State for War, was forced to resign because of what Prime Minister Neville Chamberlain called "a strong prejudice" against him. Belisha, the only Jew in the government, had been attacked by a notoriously right-wing magazine called "Truth". But he may well have sensed that behind this attack was a conspiracy hatched within the very government he served. 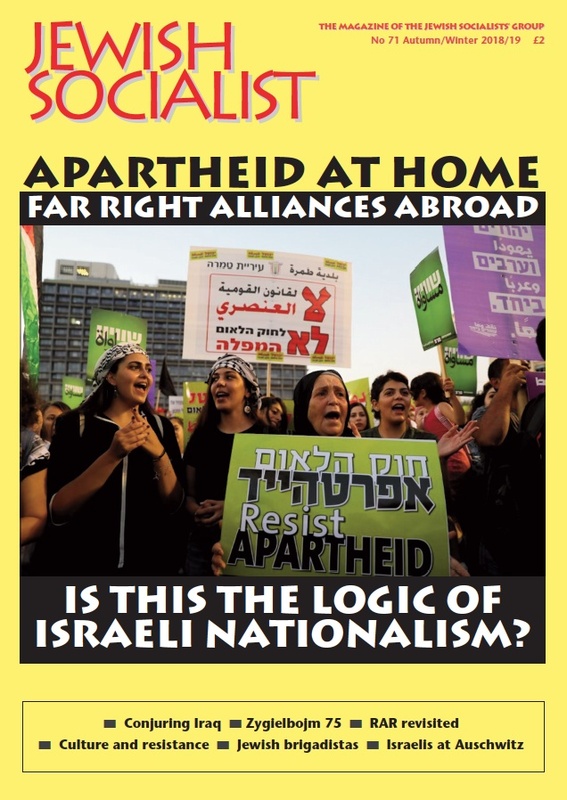 In this article, first published in Jewish Socialist in Spring 1990, Charlie Pottins traces the connecting threads, and shines a light down some of the darker corridors of power in Britain. There was an expectant air in the House of Commons on the morning of 16 January 1940. Leslie Hore-Belisha, forced to resign as Secretary of State for War because of what Prime Minister Neville Chamberlain would only call "a strong prejudice" against him, was due to make a state­ment to the House. Interest stretched far beyond Westminster. "The British people have a right to be told frankly and fully the reasons for the replacement in wartime of a virile and apparently successful War Minister," declared the Melbourne Argus on 8 January. Even The Times acknowledged public concern but said much would depend on what Hore-Belisha had to say. In the event Hore-Belisha spoke of his efforts to reform and modernise the army, making it a career open to talent, so as to "bind all members of the nation more closely". He commented wryly: "It did not occur to me to consider that we were making the army too democratic to fight for democracy." This brought some cheers from Labour. But anyone hoping for a challenge to Chamberlain's government was disappointed. "When Belisha made his resignation speech it fell far short of the challenging dramatic tone which the Mirror had hoped for," says Maurice Edelman in The Mirror: A Political History. "Belisha, despite his blandness in the face of antisemitism, was acutely sensitive to the danger that his Jewish origin might embarrass the government." Misplaced loyalty to those less than loyal to him; misguided patriotism, with a war on? Nazi propagandists were delighted anyway, treating his departure as encouraging and as a faltering, ineffective, British attempt to remove "Jewish control". As for the British public, it had to accept being kept in the dark. Hore-Belisha faded even­tually from view, his name to be remembered only by the traffic beacons he'd introduced when he was Minister of Transport. The exact reasons Chamberlain got rid of his War Minister "have never been fully explained", said Dingle Foot in British Political Crises (William Kimber, 1976). Late in 1939 the commanders of the British Expeditionary Force (BEF) in France had told King George VI of their resentment against Hore-Belisha. The King discussed this with Chamberlain. On 8 January 1940 Chamberlain reported to the palace that he had dismissed Hore-Belisha, adding: "I said that as I had told him repeatedly before, there existed a strong prejudice against him for which I could not hold him altogether blameless." "What was the prejudice?" asks Edelman. "It was the kind of prejudice that no one wanted to make explicit. It was, in fact, the prejudice of the established social and military order against a Jew of middle class and foreign descent, who sought publicity for his work, rejected the caste atitudes of his day and who, for short, was referred to by his critics as a 'cad'." Perhaps Hore-Belisha's flair for publicity, so upsetting to the officers and gentlemen of the BEF with whom he dared to differ, gave Chamberlain the idea of making him Minister of Information. The Permanent Under-Secretary at the Foreign Office, Sir Alexander Cadogan, confided to his diary on New Year's Day 1940: "H told me He --.-Belisha must be got out of the WO and will be offered Ministry of Information. This blinding - and exquisitely funny. I hadn't time to get my breath, but on thinking it over, came to the conclusion that Jew control of our propaganda would be a major disaster." "H" (Lord Halifax) and the Foreign Office blocked this appointment. Instead, Hore-Belisha was offered the Board of Trade. He polite declined, "because I could not feel the assurance that the consideration which had persuaded the Prime Minister to make the change would allow my energetic discharge in the national interest of the other office". By this time, apparently, several junior ministers were clamouring for Hore-Belisha to go. But why did he go so quietly? What happened between Hore-Belisha's removal from office on 6 January and the speech which disappointed friends ten days later? On 12 January 1940, the weekly magazine Truth appeared with the headline "Belisha no loss". It raked up the financial affairs of some companies in which he had been involved, back in 1928, which had collapsed with losses all round the following slump year. Although there was no evidence of wrongdoing by Hore-Belisha, he had lent his name, as an MP, to these flops. Truth made it sound far worse; and Tory MP and antisemite Captain Archibald Maule-Ramsay made sure every MP and peer received a copy. Hore-Belisha consulted such bigwigs as Sir John Simon and Sir William Jowitt, with a view to taking action against Truth. These eminence-advised him that it would not be in the nations interest to take it to court. Later, Hore-Belisha was to say: "I must confess that in the light of subsequent events, had I been guided alone by my own personal feeling, I would have taken action." Founded by the radical, Henry Labouchere 1877, to expose corruption "without fear or favour", during the 1930s Truth had fallen into far from liberal hands. It acquired "the reputation of specialsing in a rather significant way in those scandals with which persons with Jewish names happened to be connected". An article in Truth in August 1938 spoke highly of Hitler as a "sensitive" artist, while the 24 September 1939 issue had Major JFC Fuller's column defending the Nazi concentration camps(mentioned in a Commons debate in 1941). Fuller, a well-known military historian, was also a keen Mosleyite. How could a man in Hore-Belisha's position, twice a Minister of the Crown, a respected public figure, be thrown off balance by an attack in a little right-wing rag, allowing it to undermine his confidence and help finish his career? It was because he believed that there were some much more powerful forces behind the well-timed blow from Truth. Cecil King, Hore-Belisha's supporter and confidante, said: "Finally, through the Conservative Central Office, they engineered a very bitter article in Truth which attacked his financial records as a director of companies in the 1928-9 boom, and inddentally described the Daily Mirror, for supporting him, as the 'Jew-infested sink of Fleet Street.'. As part of this campaign, Belisha said, Lady Astor was going around saying he had feathered his nest on army contracts. This campaign filled in the gap between Belisha's dismissal and the meeting of parliament." Incidentally, as War Minister, Belisha did not deal with army contracts, which came through the Ministry of Supply, but who cared? Leslie Hore-Belisha had come up against what would nowadays be called a Tory "dirty tricks" campaign. It was during the notorious "Zinoviev Letter" affair (when the Daily Mail ran a faked letter to create a "red scare", hitting Labour and scaring Ramsay Macdonald out of his wits) that JC Davidson, liaising between Conservative Central Office and the security services, met Major Joseph Ball, then with MI5. By 1927, he was at Central Office as director of publicity. In 1929, responding ostensibly to those Conservatives who had been saying they needed a depart­ment to develop social policy, the Party set up the Conservative Research Department. With Joseph Ball in charge, the approach to social and political problems was a distinctly secret service one. From 1929 until his death in late 1940, Neville Chamberlain was chairman of the Conservative Research Department. In February 1938, Foreign Secretary Anthony Eden returned from holiday to find that, in his absence, Prime Minister Chamber­lain had rejected overtures from President Roose­velt for international security efforts, preferring the "wonderful chance" of an agreement with Mussolini. He was further upset to find that Italian ambassador Grandi appeared to know more than he did about British intentions. Chamberlain and the Italian almost seemed to have an understand­ing already. Behind Eden's back, the Prime Minister had been in regular contact with fascist Italy, through irregular channels. One of them was Sir Joseph Ball, "the confidential agent of Chamberlain, who since the month of October last year has been functioning as a direct 'secret link' between myself and Chamberlain", as Grandi boasted to Count Ciano, Italy's Foreign Minister, on 19 February 1938. Eden resigned on 20 February. In October 1937, Ciano had signed a secret treaty in Berlin, pledging war on "communism" and the Spanish Republic; the beginning of the Axis. In February 1938, while sweetening the British with promises to respect their interests in Spain, Musso­lini gave the green light to Hitler for the Anschluss, the invasion of Austria. March 1938, on the streets of Vienna, grinning Nazi thugs assault and humiliate elderly Jews, making them kneel and scrub pavements with caustic lye, or perform press-ups for the amuse­ment of the mob. April 1938, in Rome, to mark the signing of an Anglo-Italian agreement, an English Jew comes to grovel on behalf of His Majesty's government. Leslie Hore-Belisha says it gives him "great joy" to meet Signer Mussolini and see his achievements. Besides press control and manipulation, the government was alive to the importance of other media. In March 1935, Isador Ostrer of Gaumont British agreed to help the National Publicity Bureau organise itself for propaganda. At British Movie­tone, Sir Gordon Craig and Sir Malcolm Campbell were ardent Tories. Editor Gerald Sanger advised the Tory Party on film propaganda. "I have cultivated some close personal contacts with the leaders of the British film industry," Ball reported confidentially to Chamberlain in June 1938, "and I am satisfied that I can count upon most of them for their full support to any reason­able degree." Stressing the importance of exploit­ing the screens of the ordinary cinemas, seen by 20 million people each week, Ball said: "I have already prepared the way for this with all the big circuits among exhibitors ... with Korda among the pro­ducers, and with the chairmen of the five big newsreel companies." An interview with Labour leader Attlee on Eden's resignation was cut from Paramount news within hours of filming. During the Munich crisis, MPs opposed to Chamberlain were censored. Newsreel coverage of the Spanish Civil War had a pro-Franco bias that was remarked upon. Govern­ment control might also help explain the bland treatment of Nazi Germany in pre-war newsreels. Ball used other techniques too. A group of rebel Tory MPs had begun meeting at the Queen Anne's Gate home of Ronald Tree. He noticed odd clicks on his telephone. An American journalist friend told him it was being tapped. He said: "Some time later, during the war, I came across Sir Joseph Ball at the Ministry of Information, a dislikeable man with an unenviable reputation for doing some of Chamberlain's 'behind-the-scenes' work. . He had the gall to tell me that he himself had been respon­sible for having my telephone tapped." According to one-time Central Office worker Percy Cohen, interviewed by Arnold Beichman, Ball "meddled in all kinds of affairs, some secret, some open. He was a man who was always intriguing and who new how to make contacts. If Chamberlain wanted a job done, it was always through Ball." Did they do a job on Leslie Hore-Belisha, using the antisemitic Truth magazine? How closely was this foul little weekly connected with high-rank­ing members of the Conservative Party? The Jewish community was concerned about Truth. "For a considerable number of years part it has been easily the most venomous antisemitic paper in this country, all the more dangerous as its antisemitism has been of an insidious and subtle nature," Sydney Salomon told the Board of Depu­ties' Jewish Defence Committee. "Efforts have been made both in public and private to combat this policy. There are forces behind [it] which are obviously of a powerful nature, but they keep carefully in the background. We have not yet, however, abandoned hope of forcing them out into the open." During the war, with Truth maintaining its antisemitic line, the Board was told: "There is still a very strong feeling that the [Conservative] Cen­tral Office is interested in this paper." "It is widely read, not so widely as the Daily Worker," he conceded (an allusion to the government's ban on that paper), "but very widely in the clubs and messes, by that large class of people who are referred to as the governing class in this country." Describing it as "pro-fascist" and "antisemitic", Wedgwood mentioned Truth's attacks on Jews, including Belisha, Labour MP GeorgeStrauss,Neville Laski and VictorGollancz, and "numerous libel actions" it had faced. "As in the case of all newspapers, there is somebody at the back of this newspaper. It must be owned by somebody. There are 1,920 shares of which 1,800 are in the name of Lloyds Bank, probably held for other people as nominees." The shares were £10, Wedgwood said, but he did not believe Truth could have paid its way with a capital of £18,000, "seeing the damages they have had to pay in these libel actions". He judged that the money behind the magazine had come from the National Publicity Bureau initially, and then from Tory Party funds. Although shares had been shuffled around, "through these kaleidoscopic changes there appear the figures of Mr Crocker and Sir Joseph Ball, not as directors but as connected with Truth. I understand these people are also in the Swinton Committee [the government's Security Executive]... I am more anxious to get the attitude of the Swinton Committee towards the fascists and towards the Jews, changed than even to get a change in the editorship of Truth". It was certainly ironic, if not something more, that while Ball had become deputy chair of the Swinton Committee and brought along his friend, Charles Crocker, a director of Truth, that magazine was attacking the 18B internment law over which the Committee presided as "Jewish revenge", and stoutly defending interned Nazi sympathisers like Admiral Sir Barry Domville! (The Swinton Committee also directed the internment and depor­tation of Jewish refugees and other "enemy aliens"). During the debate, Aneurin Bevan remarked: "I understand that until recently the Hon. Member for West Lewisham was an official of the Conser­vative Central Office and at the same time chair­man of Truth." The "honourable" Member for West Lewisham, until he lost his seat in 1945, was Henry Brooke, later returned for Hampstead; Housing Minister (1957-60); Home Secretary 1961-63). Between 1936 and 1939, Brooke was deputy director of the Conservative Research Department and chairman of the Truth Publishing Company. This was mentioned by Horace B Samuel in a letter to Time and Tide, published on 22 November 1941. Sir Robert Vansittart, whom Chamberlain had sacked from the Foreign Office, engaged Samuel to conduct a confidential private enquiry into Truth. He found that in June 1936, after Labouchere had died, the bulk of shares in Truth had been acquired, via Lloyds Bank, by Lord Luke of Pavenham, a close associate of Sir Joseph Ball and chairman of the National Publicity Bureau's business commit­tee. To conceal the link with the Bureau, whose funds had been used, shares were handed out in small bundles to associates of Luke and Ball. Henry Brooke took 10. When he became an MP, he passed them over to Crocker. Samuel's report to Vansittart was that Cham­berlain and Ball were behind Truth's attack on Hore-Belisha: "a deliberate effort to kill Belisha once and for all as a political force". Chamberlain died in November 1940. Truth carried on. A fortnight after its ownership had been raised in the Commons in 1941, a block of 1,800 shares was quietly shifted to editor Colin Brooks. W C Crocker resigned his directorship. The following year Ball left the Swinton Commit­tee. He remained at the Conservative Research Department until after the war. In 1942, Conserva­tive Party chairman Sir Thomas Dugdale, com­plaining that the Party had no press to call its own(! ), told Truth's editor that his was "the nearest to a dependable organ' . RA Butler, who took over the CRD in 1946, said he found "no funds or even records". Chris Cooke's Sources in British Political History, noting that cer­tain CRD records remain confidential, adds that most old files were destroyed anyway, "partly the result of a wartime fire, and partly of a conscious policy". The entry for Henry Brooke says: "Lord Brooke states that he has not discovered any papers which would be of interest." In 1954 Truth printed an apology to Leslie Hore-Belisha for having made "unfair and baseless attacks upon him motivated by racial prejudice". Better late than never! The paper ceased publication two years later. In 1956, Sir Guy Kindersley wanted to publish his account of how he had brought the Zinoviev Letter to Tory Central Office. He was invited to a City office where Sir Joseph Ball persuaded him that certain things should remain concealed. Lord Davidson said Ball "is undoubtedly tough and has looked after his own interests... On the other hand, he is steeped in the Service tradition and has as much experience as anyone I know of the seamier side of life and the handling of crooks." When Henry Brooke became a minister in the 1960s, people were too polite to mention his past (Brian Pearce, in The Newsletter, 19 March 1960, was an exception), even when he was being peti­tioned, as Home Secretary (and author of the Immigration Act) to do something about racists and fascists. (He strengthened the Public Order Act instead.) This is a matter of Tory Party, not individual, history; but until recently even some historians have seemed unwilling to look into it. Leslie Hore-Belisha was one of theirs, if not quite one of them. As a Jew he was disposable and they didn't mind how they did it. Neville Cham­berlain was, according to James Margach, "the first Prime Minister to employ news management on a large scale". Nowadays, of course, the tech­niques of media manipulation and "dirty tricks" are much more advanced and sophisticated, and those who wield them at least as ruthless. 1. The Diaries of Sir Alexander Cadogan, 1938-45, edited by David Dilkes (Cassell). 2. Doctor in the Whips' Room, by H Morris-Jones, cited in Tony Kushner, Persistence of Prejudice (see Further reading). 3. The Private Papers of Hore-Belisha by RJ Minney (Collins 1960). 4. "Coy Connection" by Brian Pearce, The Newsletter (Socialist Labour League, 19 March 1960). 5. Anthony Eden by Robert Rhodes-James. Twilight of Truth by Richard Cockett (Weidenfeld 1989). Examines Chamberlain's press manipulation. Has gone into Vansittart papers and boldly exposes Ball's link with Truth. Collar the Lot by Peter and Lenni Gillman (Quartet 1980). Wartime internment and deportation of refugees, with interesting sidelight on Ball and 18B, etc. The Persistence of Prejudice by Tony Kushner (Manchester University Press 1989). A thorough survey of British antisemitism during the "war against fascism"; also raises questions about attitudes on the Left. The Abuse of Power by James Margach (WH Alien 1978). The Private Papers of Hore-Belisha by RJ Minney (Collins 1960). A Class Divided by Robert Shepherd (Macmillan 1988). Anthony Adamthwaite: "The British Government and the Media, 1937-1938", Journal of Contemporary History, vol18, April 1983. Arnold Beichman: "Hugger-Mugger in Old Queen Street" Journal of Contemporary History, vol 13,1978. TJ Hollins: "The Conservative Parry and Film Propaganda Between the Wars", English Historical Review, vol XCVI, no 379, April 1981. Thanks are due to the late Brian Pearce for first arousing my curiosity about the connection between the Tory party and Truth magazine, when he pointed out that then Home Secretary Henry Brooke had omitted this involvement from his entry in Who's Who. Thanks also to historian John Hope, who was able to give me details of archives he had seen which supplied some missing links in this story. If I did not take the time and trouble to follow his leads to primary sources, I nevertheless drew confidence from his confirmation that I was more or less on the right track. Thanks to the editors of Jewish Socialist magazine for giving this article its first airing, in issue No.19, Spring 1990.